Don Juan's has a new home after moving to a new space on N. Monroe. The business can now be found at 1215 N. Monroe St in Spokane. With several years in business in Spokane, Downtown's Jazz Salon is planning to relocate to another new space in Downtown Spokane. Soon Jazz Salon will move from their current space at 108 N. Washington to ground floor space in the newly renovated Huppin's Building at 421 W. Main. With many locations around Spokane and Coeur d' Alene already the Anytime Fitness chain is investing more into the Inland Northwest with a new location within the 5 Mile Shopping Center. The new 5 Mile Anytime Fitness will be just down from Rosauer's in the plaza at 1804 W. Francis. And just like all other Anytime Fitness locations, this club will also offer work-outs " anytime " by being open 24 hours to members. A new pet supply business has opened up shop in the East Central neighborhood. The retail shop is called Thrifty Pet and can be found at 728 E. Sprague Ave. In addition to selling merchandise, Thrifty Pet also purchases some gently used pet items. Still providing IT and copier sales and service among a group of other services for the business community, Northwest Office, has relocated it's Downtown Spokane office. The new office can be found just east of Downtown at 1206 E. Sprague . The Wall St. T-Mobile is actually a T-Mobile dealer location operated by the company Express Locations. Express Locations is a Wenatchee based company that operates many of the T-Mobile stores in our portion of the country, in fact they operate over 100 stores. I inquired with Express Locations who said the River Park Square location closed down after the lease ran out on the space on Wall St.. They said they are in the "final stages" of securing a new space Downtown or nearby Downtown to replace the old space. They did not say where this new location will be but did say it should be open by the end of the year. For now however, Express Locations T-Mobile, does still operate a location about a mile north of Downtown. That location is at the corner of Ruby & Mission in the same shopping center as Jimmy John's at 105 E. Mission Ave. To contact the Mission Ave. T-Mobile store call 509-326-0697. One of the key aspects I look for when looking at new businesses to post about on this site is uniqueness. If a business is new and brings something new to the area it will go to top of the my list. Such is defiantly the case with the Lavadog , a new fast service restaurant now open in Hayden. The business can be found in the same shopping center as the Hayden Super 1 grocery store at 180 W. Hayden Ave, by Hayden and US 95. Lavadog is a locally owned and operated Hawaiian themed hot dog restaurant with a menu full of specialty hot dogs topped with a variety of delicious items. All hot dogs served at Lavadog are 1/4 pound and made of 100% beef. Sorry the menu pictures are so blurry as they had to be blown up from their original size. A good way to find out parts of the menu that are unable to be read is the check Lavadog out in person. Lavadog actually began the process of setting up shop in the Super 1 shopping center during the late fall of last year. The space sat, appearing ready to open, with signage and everything for a number of months. Honestly this blogger had even written this one off as probably not going to ever open. So, it is very satisfying to see that they have overcome whatever issue kept them from opening and are now officially open. Over the last winter the Hooters Restaurant chain , kind of unexpectedly, closed down their restaurant in Spokane Valley. At that time we found out and reported that the space would be remodeled and turned into not one but two new restaurants. Now flash forward to present day, all the new business are now complete and open in the building which is at 16208 E. Indiana Ave. , just east of Spokane Valley Mall and the I-90 / Sullivan Rd. exit. Open in the middle suite of the building is 50 / Fifty or 50/50 . 50/ Fifty is a bar and restaurant with a variety of normal and out of the ordinary burgers. What sets the burgers apart at 50/ Fifty is the patties are made of a blend 50% bacon / 50 % beef or 50% lamb / 50% beef. No word on if all beef is available. And, in keeping with the fifty theme 50 / fifty also has 50 beers on tap. Open daily from 7am till 2pm is a new family friendly breakfast restaurant called Egg It on. Egg It On is in the space that's furthest west in the building. Egg It On is described as a urban farm fusion style with many unique items on the resturants menu. Including a Fruity Pebbles French Toast or a Crunch Berry French Toast among many others. When Hooters still occupied the building they also had the Owl Club Casino on the eastern side of the building. The casino concept is still open at 16208 E. Indiana, however it is now Even Stevens Casino . Get Air Trampoline Park coming to Northtown Mall? We can't confirm it, nor can we give really any details. However it appears a business called Get Air maybe coming soon to Northtown Mall. The business has filed building permits for tenant improvements and adding doors to a un-mentioned location within 4750 N. Division, which is Northtown. A quick Google search shows Get Air is a chain of trampoline jumping businesses with a few locations in business now. Included in their location is a location in the Tri-Cities and one coming soon in Yakima. Making Spokane a logical choice for a new location. We will continue to watch this. It is also of mention another business of similar industry, Sky High Sports, is already in Spokane, with a location on Front just east of Downtown Spokane. If your following along here on Inland Northwest Business Watch, and the local media, you probably already know that the new South Hill Target opened for business this week. But what you may not know is that during the ribbon cutting for the Target store, Regal Plaza developer Dave Black announced a few additional tenants coming soon to the Target anchored shopping center. A Seattle based pizza restaurant chain. This will be chain's first Spokane location, watch for more on this in the near future. Perhaps Great clips or Supercuts? It was mentioned at least a couple of tenants have signed letters of intend to locate at Regal Plaza. However, these we're not announced as of yet. Many, additional tenants have been rumored to be opening at the plaza. Also a rumor has been swirling around for a few months of a Winco Foods grocery store at or nearby the Regal Plaza project site. This also has never been confirmed but appears may be true just on one of the other parcels closeby. Described as a fabric and gift store that will also be a " Quilter's Quilt Shop , Regal Fabrics and Gifts, will open next month on the South Hill. Regal Fabrics & Gifts will be located at 5620 S. Regal St #8 and will be owned and operated locally by Irene Fransk who herself has been an avid quilter and seamstress for over 40. Fransk has even operated an online sewing business for a number of years. The new business will offer high quality quilt fabrics and notions, custom sewing products as well as offering a variety of quilt and sewing workshops. The store will also feature hand crafted gifts and collectables from local artisans. Regal Fabrics & Crafts is tenitivly scheduled to open on or about Aug. 9th. The store's grand opening will be held August 15th and 16th. In all the business will employ 5-7, all of which will be very knowledgeable and passionate about sewing and the products they sell. Hours of operation will be Monday - Saturday 9am - 6pm , although a wine & sew event night will be held Thurs. evenings and on one Thurs. night a month will be a coffee, tea & dessert night. By the time this posts to the site, Spokane will have one more new big box store. That store is the much anticipated Target store in the Regal Plaza development on the South Hill. The new South Hill Target's soft opening is scheduled to be today at 8 am with regular store hours to commence from this point forward. The new Target's store hours are 8am till 10pm and official grand opening is also coming soon. That official grand opening we're told will be Sunday and will share when we get all the details on that event. The new South Hill Target is located at 4915 S. Regal , in one of the anchor spaces at Regal Plaza, a large new shopping complex at Regal and Palouse Hwy. Another anchor tenant has also been announced and will be a Petsmart store opening later. The grand opening come right on schedule for the store which has about 135,000 square feet of space and employ's about 200 total. As I am writing this I have yet to see the store inside. However I do know the new store will have a in store pharmacy. In addition the store will have a grocery department. INBW is planning on checking out the store very soon and hopefully posting more info. Please, vote for INBW best local blog ! Online voting for KREM 2 News' poll for The Best of Spokane starts TODAY! Just like in years past Inland Northwest Business Watch is up for best local blog. In fact, last year we placed 5th out of 31 local blogs. Inland Northwest Business Watch is a hobby project of mine so it would be a honor to win in 2014. Thank you for voting!!! If INBW wins I'll come up with some way to thank all of you, my readers! In October of last year INBW was one of the first to break the news of the coming renovations at Northtown Mall ( not too brag or anything! ) . But at that time we we're told and posted that the renovations would begin in first part of 2014. But now here it is July and it seems like not much has happened yet. So, we figured it was about time to ask and see what is going on with this large project. And as it turns out the project, has in fact begun! Construction actually started recently, with Northtown's management telling me that all of the work at this time is being done in the back of house, out of sight of the mall's customers. Currently workers are adding structural bracing to replace with structural elements that will be removed by the demolition on the north side of building. The next phase of construction, however will be more visible with barricades,etc... being place inside the mall corridors probably sometime in August with no official date for that phase to start. Also, the move of tenants out of the north side corridor is complete, which was also a major undertaking for the mall's staff. Here at INBW we've been asked a couple times for confirmation of rumors new restaurants and tenants coming to the mall's newly re-developed section. We asked about this as well, but the mall cannot release any names as of now. I'd guess we'll probably learn more about anything new later this year since completion is still looking to be around the start of next year. But, we cannot be sure for some time. We will continue keeping an ear out for confirmation and additional rumors. So, what all is planned to be done to Northtown Mall? Over here at INBW HQ we've been wondering how far along the new Saranac Commons project is, and apparently we're not the only one. That's because the building owners are hosting a tour of the project today at 4pm. While the project is still new enough for us not to have every detail on it as of today, we can confirm that a large new apartment building is going up very soon on land along N. Ruby nearby Gonzaga University. The new apartments will be part of the University District and will be located at 940 N. Ruby, just north of the new ARC of Spokane Thrift Store and the Spokane River. Both pre development info and grading/ site work permits have been filed with the city and construction will be done by the locally based Baker Construction & Development. In the permits the apartment complex is listed as Ruby Apartments, so it is assumed this will be the apartments name once opened. Ruby Apartments plans show 61 total apartments with 6 floors including 1 ground floor which would used for parking for the apartment tenants and guests. The project, which is being developed by Preferred Asset Partners of California will offer 3 apartment options. There will be 1 one bedroom , 40 two bedroom and 20 three bedroom apartments in all. We are working on gathering more info on this project which appears to be just another addition in what might be a bit of a renaissance for the section of University District along Division / Ruby north of Downtown. Another major project, in the former Burgans Furniture building will be wrapping up later this year and a couple of other sites have seen development for the first time really since before the economy took it's turn. Spokane's Davenport Collection of hotels is joining a hotel brand and all hotels in the collection will change names slightly to reflect the new branding. The hotels included in the Davenport Collection are the Davenport Hotel , Davenport Hotel Tower , Hotel Lusso and the new Convention Center Hotel. The Davenport Collection will be part of Marriott brand, but because of the property's historic and upscale status none will change much at all and no large Marriott signs,etc... will be placed on the hotels. In fact, the Davenport will actually be part of Marriott's Autograph Collection. The Marriott Autograph Collection is a new sister branding off of the main Marriott brand for independent , upscale and / or prestigious hotels. The Autograph Collection is made up of over 60 different hotel properties with none in the Northwest as of now. The Davenport will officially join the Marriott Autograph Collection sometime before the end of 2014. In addition to the branding with Marriott, The Davenport Collection has also named it's huge new hotel going up across from the Spokane Convention Center in Downtown Spokane. That hotel will be called Grand Hotel Spokane. We're also finding what may or may not be the first restaurant going into the Grand Hotel Spokane. But we will wait on confirmation before posting on this site. 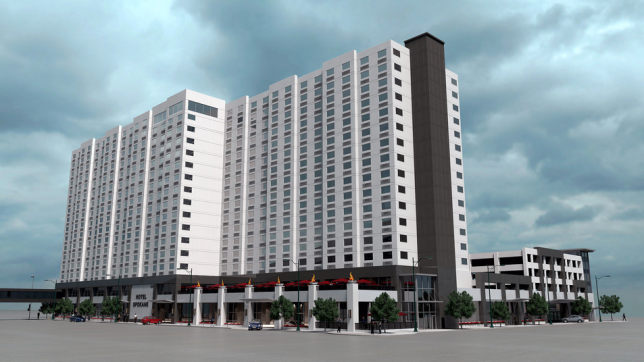 Additional renderings are also available on the hotel's main web site, listed above. Today, July 16th is opening day for one of the most highly anticipated new restaurants in Spokane. Today at 11am is official public opening for the new Veraci Pizza in Kendall Yards. Veraci Pizza is now in a newly built stand alone building on Summit Pkwy next door to the Inlander's offices in Kendall Yards, just north of Downtown Spokane. The building overlooks the Spokane River and is actually the last in a short series of restaurants to open recently in the Kendall Yards urban mixed use development. Veraci Pizza still uses a wood fired oven and will also continue serving pizza at area farmers markets. The business is owned and operated locally by Seth & Laura Carey and was even voted Best Pizza in Spokane by the spocool.com blog four years in a row. Veraci Pizza is also affiliated Veraci Pizza in Seattle. That location is at 500 NW Market St. , Seattle. The official address for the Spokane location is 1333 W. Summit Pkwy. 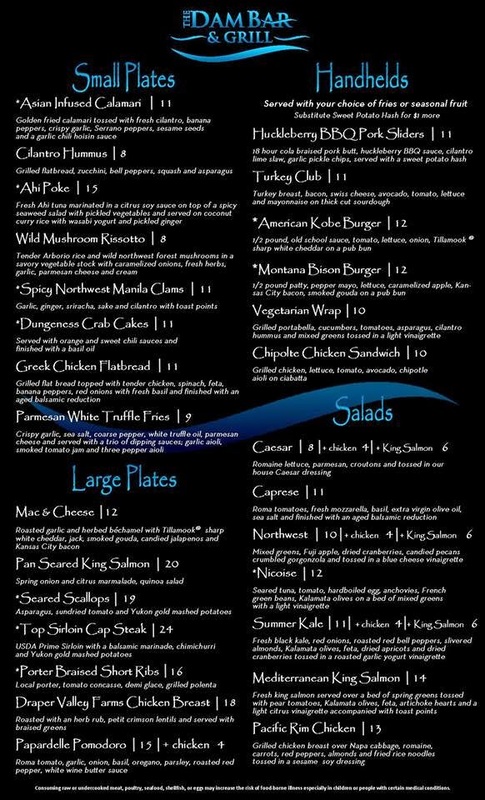 "Nate's is locally owned and operated in Post Falls. We are home of the 36' Pizza. Great craft beers on tap. We are Post Falls best known secret! " " The salon just opened yesterday. " " Our goal at salon illuminate is to help you feel amazing, look incredible, be relaxed and taken care of and be understood "
" Kershaw's Office Supplies has been locally owned and operated in Spokane since 1900! Come visit us for all of your business supplies and furniture "
A couple of years ago the Staples chain began making major changes. The chain is in varying processes of downsizing many of their stores and streamlining them for better overall customer experience. And now much of that downsizing is hitting the Spokane and Coeur d' Alene area. Some of the downsizing has even included store closures ( 225 stores will close by the end of 2015 ) but as of now none of those closures will be here in our local area. Probably the biggest change for any of the Staples stores in the Spokane metro is happening to the Staples in Spokane Valley. There, Staples will actually move out of their current store completely at 15224 E. Indiana. The Valley Staples will move about a mile west to 13804 E. Indiana and will occupy a store that about half the size of the store at 15224. Also the new Staples will be a new construction as the store will be one of several new tenants moving into a building that's under construction now next door to Total Wine & More in the Evergreen Crossing Shopping Center. Staples has already completed the downsize of their store in Coeur d' Alene. That store is now somewhat smaller after construction wrapped there last year. The Coeur d' Alene Staples store is in the same location it has always been at 206 W. Ironwood Dr. in the Ironwood Square Shopping Center. The space left behind by Staples is still up for lease. The Staples store in North Spokane at the Northpointe Shopping Center is in the process of downsizing now. That store which is at 9960 N. Newport Hwy will be divided into two spaces almost equally. No changes at Northtown area Staples. Staples is office supply chain also with copy, fax and print services provided in most of the large national chain's stores. The chain is based in Farmingham,Mass. with almost 1,600 stores in the United States and almost 2,300 stores worldwide. Using the witty term " it's about dam time " on it's recent marketing is one of Spokane's newest and most exciting restaurants. That new restaurant is The Dam Bar & Grill and is actually in the exact same location as the Park Place Lounge once was within the Red Lion at the Park Hotel at 303 W North River Drive. The location is very convenient, being within walking distance of Downtown, Riverfront Park and the Spokane Convention Center. And, the new Dam Bar & Grill takes advantage of their scenic location overlooking the dam, perhaps one of the more unique views from a restaurant in the area. Also, Dam Bar & Grill is also just off of the Centennial Trail allowing the new restaurant to cater to walkers, joggers, runners, etc... all using one of the busiest sections of the entire trail. The restaurant also features a great outdoor patio for outdoor drinks or dining, something many in our area seek out. We'll share some of the businesses right here in this post, In front of everyone on inlandnwbusiness.com. It's just like free advertising! With the popularity of the Kendall Yards urban village style development near Downtown Spokane, it only makes cense to try the urban mixed use project format in other parts of Spokane. And, while not all of details seem to be set in stone right now, another urban project will soon rise on the South Hill. The project is called Quail Run and we we're alerted to this by The #Spokanerising Project, a very interesting local urban planning blog ( http://spokanerising.wordpress.com/ ) . And a little research turns up that Quail Run does look like a plan that could become one of the largest and hottest projects in Spokane. To add to good ideas behind the project, Quail Run also has the whole location, location , location thing going for it. Because Quail Run will be located on current vacant land about a block west of the Southeast Blvd/ E. 29th Ave. intersection on E. 29th . The project is also only blocks from the Trader Joe's anchored Lincoln Heights Shopping Center, and even closer to the Rosauers anchored Lincoln View Shopping Center. Quail Run appears to be largely commercial with the developments web site showing three possible site plans. All of which show a number of available units facing a main central roadway that has yet to be built. In one of the possible site plans, a large building , probably for a big box store is also included. However no big box or any tenants have been announced as of yet. The development plans to be pedestrian friendly with walkways and water features throughout. The project is still obviously in the planning phases but leasing is already underway and some work has already been done to ready the site. The commercial real estate market in Spokane seems to be really hitting it's stride. With several renovation projects already underway in Downtown Spokane a few high profile Downtown buildings have also changed hands recently. The three story historic 1889 Building located not far south of Walt Worthy's Convention Center Hotel high rise project has been sold. The building was acquired by Spokane based CitiBrokers who will move their own offices into the currently empty 3rd floor. Along with the move by CitiBrokers to open a office in the building, the company also promises to hire more staff to keep up with the demand at the local real estate / real estate investment firm. The building was sold for 1.02 million and will have some renovations done. However current tenants which include the popular Nectar Tasting Room will stay in the building. Located nearby Spokane's up and coming SoDo business district the historic six story Holley Mason Building has also been sold. The new owners are a company called Holley Mason-20,LLC who is led by local real estate investors Bobby Brett , George Brett ,Chris Batten and John Pariseau. The building was purchased for about $4 million dollars and will also receive some upgrades as part of the new ownership's plans. The building will retain it's current use as prime Downtown office space. Most of the lower floors of the Holley Mason are used as call center for the Omaha,Neb. based West Corporation. Located just north of Downtown Spokane is the sprawling campus of the Rock Pointe Corporate Center. Which has also now been sold to new owners. Rock Pointe's four large office buildings on 11 acres of prime land are now under the operations of Unico Properties, a Seattle based real estate investment firm. Unico is also already a recognizable name in the Spokane marketplace. That's because , Unico also owns the Bank of America Financial Center which offers 18 floors of office space in the Downtown core at Howard & Riverside. The sale price for the buildings was not announced. Unico plans to make some renovations to the property as some of the property has struggled lately due to the former owner's bankruptcy that was filed a couple of years ago. Several large companies call Rock Pointe home and more tenants will likely be recruited under the new ownership. The popular Big R Stores chain is planning a major expansion of it's store in Coeur d' Alene. In fact the expansion will make the mid box store about 3 times larger. Site work and grading is already underway on the expansion site which is adjacent to the current building. Plans call for the building to be expanded to the South and onto land that's partly behind the neighboring Great Floors store. Once the expansion is complete the Coeur d' Alene Big R will have over 80,000 square feet of floor space. With all the new space some of the store's seasonal departments will become permanent departments. The store is located at 170 E. Kathleen Ave within sight of the major Kathleen & Government Way intersection. The store was originally a location of the much smaller D & B Farm & Home chain which had a similar verity of merchandise and was acquired by Big R Stores in 2011. Big R Stores are big box farm and home retailer with a large verity of departments. In recent years the chain has expanded their product mix and includes farm , home , automotive and sporting goods items among others. Although, The Gorge Amphitheater is over 100 miles from Spokane, it's economic impact hits Spokane and all of Washington State. With many concert goers coming from Spokane, Seattle and points in between to see the big name concerts that includes a number of live music festivals. And soon we may see that economic impact grow significantly with Amphitheater owner, LiveNation , being now in the planning phases of a major expansion to The Gorge, making it one day a full destination resort. We have very little info but we have learned that the owners of NUDO, one of Spokane's newest and hottest restaurant is planning to open yet another new restaurant in Downtown Spokane. The new restaurant will be a burger concept restaurant called Burger-Lab. The info we have is that Burger-Lab will be in the former Wojo Works décor store at 824 W. Sprague. However sometime back we contacted one of the owners, who made mention the new business might be in the former Agave Latin Bistro space immediately to the west of 824 at 830 W. Sprague Ave.
We will post more just as soon as we have and will link that article to this posting. We checked and confirmed that Burger Lab will , in fact, be in the former Agave Latin Bistro space at 830 W. Sprague Ave.